Boulevard Books announces the publication of New York Justice, a memoir by retired Supreme Court Justice Joel Goldberg, one of New York’s most experienced criminal trial judges. The book provides rare insights into the criminal justice system from the point of view of a judge who presided over hundreds of felony trials in Brooklyn and Staten Island. There are vivid descriptions, told in short-story style, of dozens of his felony trials, both convictions and acquittals, including murders, rapes, child abuse, shootings of police officers, armed robberies, burglaries, a fake nursing school, an organized stolen car ring, and even a trial involving an assault on a pet cat. 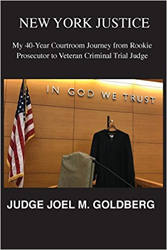 Judge Goldberg also provides a look back to the 1970’s when he began his legal career as an Assistant District Attorney in Brooklyn learning how to handle himself in both trial and appellate courts while making his share of mistakes which he recounts with self-deprecating humor. New York Justice is currently available in paperback at amazon.com and other on-line outlets.